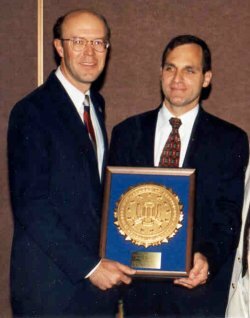 FBI Director Louis J. Freeh presenting Commissioner Anthony with the Louis E. Peters Memorial Service Award in 1995. In 1995, the Federal Bureau of Investigation honored Bob Anthony with its highest honor, given to a citizen "who at great personal sacrifice, has unselfishly served his community and the nation." "I am delighted to make this presentation to a very capable, to a very courageous and a very wonderful citizen and member of our community and now a member of our FBI family. 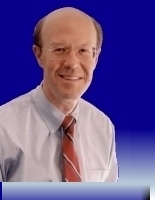 "Bob Anthony was educated at the University of Pennsylvania's Wharton School of Finance. He earned graduate degrees from the London School of Economics, Yale University and Harvard's Kennedy School of Government. He served in the U. S. Army Reserve to the rank of Captain. He began a career in public service in Washington D.C. as a staff economist for the House of Representatives, Interior Committee, then moved to Oklahoma and served on the Oklahoma City City Council. In 1980 he became president of the C.R. Anthony Company which had grown to be the largest privately owned business headquartered in Oklahoma. "In 1988 he returned to public service and was elected to the powerful Oklahoma Corporation Commission. There, he was one of three state commissioners with great judicial authority over hundreds of public utilities, trucking companies, and tens of thousands of oil and gas wells. "During his campaign, an attorney who practiced before the Commission greeted him with a handshake that contained an envelope with ten $100 bills. Mr. Anthony contacted the United States Attorney's office and agreed to participate and work with the FBI as a cooperative and covert witness. He knew at that time that his role would certainly be revealed at trial, and that the eventual proceedings in court might damage his ability not only to be a public servant, but to work in any public service career in the state of Oklahoma. The investigation which he caused, supported and worked in lasted approximately six years. Evidence which he developed involved illegal payments of $10,000. He made over 150 tape recordings that helped broaden the scope of the case to include another fellow commissioner and a local telephone company. "By 1992, word of the investigation and Mr. Anthony's cooperation had reached the news media. Determined to meet his duty as an elected public servant, he publicly commented on the case, explaining his part, but only to the extent required to fulfill his public duties. As a result of his inability to comment fully on the case, because he intended to protect the integrity of the investigation, the press had a field day with respect to him and his own reputation. For over two years he was featured as a "snitch" and a political opportunist, as well as being the subject of several leading cartoonists for the media. It wasn't until the case went to trial in 1994 that the full story was revealed and Mr. Anthony was vindicated when the full facts of his cooperation, dedication and sacrifice were announced in a public forum. In the interim, his campaign for a seat in the United States House of Representatives was defeated and he only narrowly won reelection to the Commission itself. "In the end, two subjects were convicted of bribery, and a clear message was sent to the leadership of both the business and political communities of Oklahoma that such conduct would not be tolerated. Mr. Anthony, by this award, joins a very select group of awardees who exemplify the tremendous courage and sacrifice that people have shown--particularly people who have put themselves and their families' welfare at jeopardy to do the right thing to support an investigation. That is a critically important commitment--when one puts his own life and welfare directly on the line. It is only with that premise and support and cooperation that the FBI, or any law enforcement organization, can do the job it is supposed to do, which is protect the people. "I am very, very delighted and pleased to welcome and to congratulate Mr. Anthony and to tell you sir that you are a worthy recipient of the Peters Award, and that you have our gratitude and respect for your courage and dedication. Ladies and gentlemen, would you please join me in warm congratulations to this year's recipient." See also Background information about the FBI's Peters Award. © Oklahomans for Anthony. All rights reserved. No copyright is claimed on non-original or licensed material. Authorized and paid for by Oklahomans for Anthony 2018.